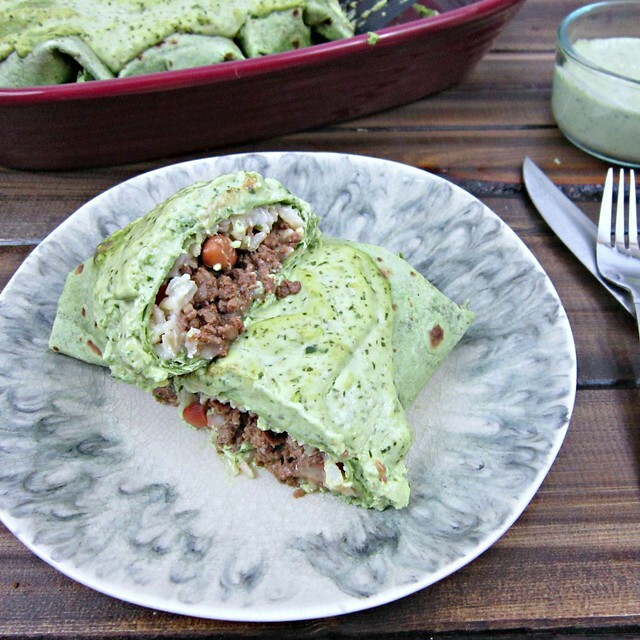 Deliciously taco-seasoned ground venison combined with cilantro-lime rice, beans and cheese, wrapped up in a tortilla and smothered in a creamy avocado jalapeno sauce is the perfect solution to the Taco Tuesday dilemma, and a great way to use up some of that freezer stash of venison!! What day is it?? That’s right, it’s TACO TUESDAY! You know, pretty much my favorite day of every week. Because, tacos. I was just talking to a co-worker today about how much I love tacos. And really, all things tortilla. And who can resist a Mexican-flavor-filled burrito?? 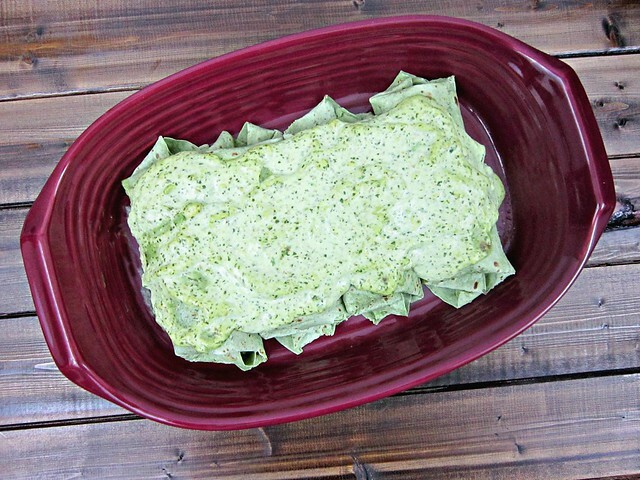 Especially when it includes venison and a creamy avocado jalapeno sauce?? I mean, you can use ground beef, chicken, or turkey if you prefer, but…I’d go for the venison. 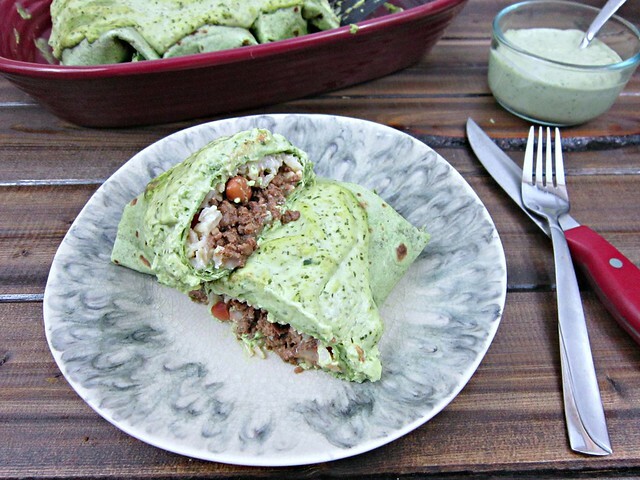 I’ve made these a couple of times, and tried some different kinds of tortillas – the ones pictured here being a spinach & herb burrito – and I think we prefer regular whole wheat tortillas in the end. I bet the chipotle tortillas would be good, but we haven’t tried those so I can’t say for sure. Maybe you will try it and let me know? But hurry, because I think I will be making these again soon! There’s a neighborhood I drive through on my way to take Natalie to daycare every morning, that I’ve just fallen in love with. The style of houses – although they are definitely older – the size of the lots/yards, and all the big, mature trees, are exactly what I would like to find some day. I can just envision my big, beautiful kitchen with lots of windows and counter space. I can all but see us there, with our little family – the kids being a bit older and running around – having friends over for weekend get-togethers, sitting around in the back yard drinking margaritas and then heading back inside to enjoy an extensive taco or fajita buffet, all lined up on that plentiful counter space. Ahhhh, that’s one for the vision board, I tell ya! But until that day comes, J and I enjoy our Taco Tuesdays together just as much. And we don’t have to share! Well, except with each other. This recipe could easily be doubled, tripled, etc. to feed a crowd, but it’s perfect as-is for a cozy little family or get-together with a few friends. Remove the seeds and ribs from jalapenos and roughly chop them. Place in a blender or food processor, along with the cilantro and pulse until finely diced. Add the avocado, cumin, and lime juice and pulse until smooth. Finally, add in the crema and blend until smooth. Set aside while you prepare the burritos. Preheat oven to 350 degrees and spray a 13x9 baking dish with cooking spray. Set aside until ready to use. Heat a large skillet over medium-high heat and add venison, stirring to break up pieces, until well-browned. Add in the chili powder through the salt and stir to coat the meat. Then add in the pinto beans and stir again. To assemble the burritos, take a tortilla and put about 1/4 cup of filling in the center and top with about 1/4 cup of shredded cheese. Then bring the sides of the tortilla in, and roll from the bottom up, into a burrito, and place in the prepared baking dish. Repeat with the remaining tortillas and filling, and then top with the sauce. I kept a little of the sauce for dipping when they were done....you can do that, or pour it all on! Bake, uncovered, for 10-15 minutes to heat through and melt cheese. Serve immediately, with reserved sauce - if you saved any.